Dividends growth stocks are great for both accumulators and retirees, although the emphasis can vary depending on your goals. For people that are in the accumulation phase of their investing career, the emphasis is generally on total returns. People in this group rationally seek out the best stable sum of dividend growth and dividend yield, so that decades from now their wealth and passive income will be maximized. On the other hand, people that are nearing retirement or who have reached retirement tend to have more of an eye on investment income. For them, while total returns are still important, higher current dividend yields are emphasized more strongly. The point here is for the portfolio to produce a ton of reliable income now or in the near future, and for that income to continue increasing faster than inflation over the long-term. Compared to investment-grade bonds, high dividend stocks can produce higher yields combined with growth that exceeds inflation. In addition, qualified dividend income is taxed at a lower rate than interest income in most cases (with the exception of municipal bonds), meaning that the effective after-tax yield that you get to put in your pocket from dividends is higher than bonds that produce similar yields. The only real catch is that even safe high-yielding stocks have volatility. During a broad market drawdown, a dividend investor’s principle wealth will decline even if their dividend income ideally remains intact, and they must resist selling at unfavorable prices in a panic. For this reason dividend stocks might not be suitable for 100% of an older investor’s portfolio, but can still provide the long-term backbone of the investment income focused strategy when cushioned by bonds and other asset classes. With that being said, here are three attractively valued high-yielding businesses with well-protected and growing dividends. Enbridge is the leading midstream company in Canada and operates one of the largest oil and gas pipeline networks in North America. The company has increased its dividend for 23 consecutive years, currently yields almost 6%, and is one of the very few midstream companies to have a high BBB+ credit rating. 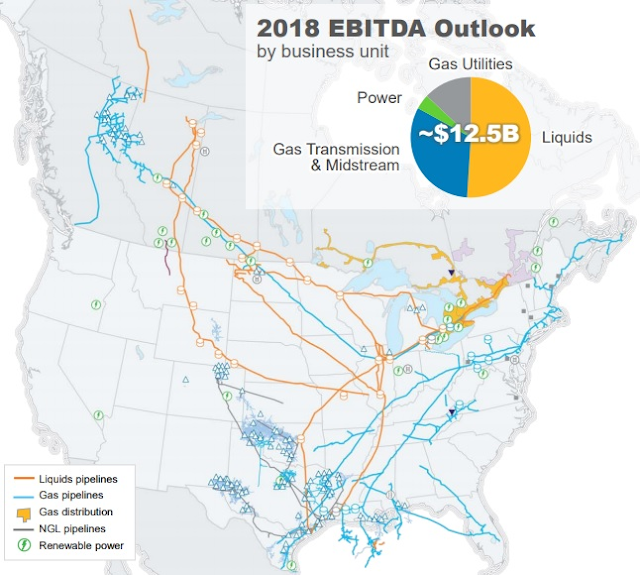 But Enbridge is a value-play currently, as it offers both a high yield and high potential dividend growth and total returns, in exchange for some uncertainty. The company is currently in the process of rolling up its sponsored vehicles- several MLPs that have run into various degrees of trouble due to high distribution yields and unfavorable recent regulatory rulings. By merging all of its MLPs into itself, it will retain more overall cash for self-funding growth projects, massively streamline the business structure, and prevent the MLPs from running into liquidity traps similar to what Kinder Morgan ran into years ago. Currently, Enbridge trades at a lower multiple of funds from operations than many of its peers, and has a dividend coverage ratio of about 1.7, which is much higher than most peers. Morningstar analysts currently have an estimated fair value of $49 for Enbridge shares on the NYSE compared to the current price in the mid-$30’s. Enbridge has virtually no direct exposure to commodity prices. The company took on substantial debt when it acquired Spectra Energy a few years ago, but this investment decision seems to be paying off handsomely. Spectra has been one of the leading and most conservatively-run natural gas transporters in the United States, with continued distribution growth through the multi-year energy bear market, and is a major source of profitably for the company as natural gas likely has a brighter long-term future than crude oil. Enbridge bought Spectra for reasonable valuations during the midstream crisis, and is now aggressively paying down debt while interest rates remain low. Debt-to-EBITDA was nearly 7x in 2015 but the company is on track to bring it down to their long-term target of under 5x this year. In fact, due to recent asset sales they most likely reached that target this quarter considering how close they were in the previous quarter. It’s important for people that are just learning how to invest in stocks to understand the concept of value investing. If you invest when everything is perfect and the market is euphoric, risks may seem low when really the high valuations create substantial investor risk. On the other hand, when a business has a wide moat and a well-covered and growing dividend, but faces various short-term uncertainties to overcome, the market often assigns an undervalued share price. As Enbridge finalizes its business consolidation and debt pay-off, the market will likely reward Enbridge with a valuation that more closely aligns with its peers, which could mean a 20%-30% increase in the multiple on funds from operations. 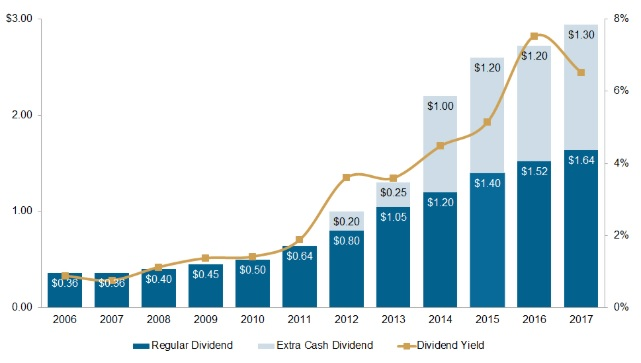 In the meantime, patient investors get to collect a growing 6% dividend yield that is expected by management to grow 10% per year for the next couple years as Enbridge becomes a dividend aristocrat. The payout ratio is targeted to stay under 65% of adjusted funds from operations. Lazard is an asset manager and financial advisory company that is not nearly as well-known to retail investors as some of the big names like BlackRock or Goldman Sachs. However, Lazard is one of the largest financial advisory business in terms of revenue, after Goldman Sachs, JPMorgan, and Morgan Stanley. Compared to those giant firms, however, the advisor business makes up about half of Lazard’s revenue, compared to under 10% for those big names. In other words, Lazard specializes in financial advisory and competes with the biggest investment banks in the world. As a financial advisory investment bank, Lazard helps other companies perform mergers, acquisitions, and restructurings. This is a rather cyclical industry, as mergers and acquisitions tend to occur more often during periods of strong economic growth, while restructurings tend to occur during times of significant economic weakness. The coolest thing about Lazard for income investors is how they pay their dividends. These days, many companies pay a small dividend and use the bulk of excess capital to repurchase shares, which boosts EPS and dividend growth but keeps the yield low. Lazard, however, pays a regular growing dividend and then often gives excess capital back to shareholders as an annual special dividend instead of buying back a ton of shares. So, if you’re after higher yields in the financial industry, Lazard is a company to look at. With a stock price in the mid-$40’s currently, and a regular quarterly dividend of $0.44, Lazard has a regular dividend yield of over 3.8%. Its special dividend can then give investors an even higher effective yield, but with less predictability. I expect that the special dividend may decrease during the next global downturn, but that the regular dividend should remain robust. In addition, Lazard still spends a bit of money on share repurchases, and has reduced the number of shares outstanding from 138 million in 2010 to 132 million today. Lazard has had very strong fundamental performance over the past decade. Between 2005 and 2017, they increased their global financial advisory market share from 7% to 9% of the total market, and increased their asset management business from 0.25% market share to 0.53% in a highly fragmented industry. Due to strong performance of its funds, Lazard has seen significant capital inflows and has increased its assets under management (AUM) to $238 billion. In addition to achieving good returns, many of Lazard’s funds are unique and highly-differentiated, which gives their asset management business a considerable economic moat. For example, while the trend for investors is away from active management and towards passive index funds, emerging markets are an area where active managers on average have actually beaten passive fund performance. 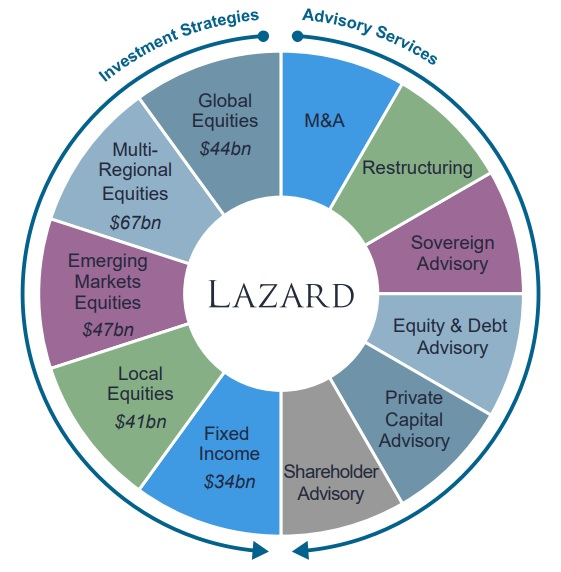 Lazard has large exposure to global equities, including emerging markets, and a variety of unique approaches. Overall, Lazard is an interesting pick for an income-focused portfolio. The stock can be volatile, however, because the financial advisory business is so cyclical. Despite strong performance, the company’s shares have traded as high as $60 and as low as $40 in the last 52 weeks. For long-term investors that can handle this volatility and cyclicality, the current price in the mid-$40’s appears very reasonable. Brookfield Infrastructure Partners is a publicly-traded partnership that operates infrastructure around the world. Like Lazard, they issue investors a K1. They operate diversified infrastructure including natural gas pipelines, toll roads, electric transmission lines, data towers, and rail lines. Their major areas of operation are North America, South America, Australia, and Europe, but they are also expanding into Asia. This global footprint makes Brookfield a good way to get international exposure. The most important difference is that Brookfield pays out only 60-70% of its funds from operations as distributions, compared to the 90%+ typically paid by MLPs. It means a lower yield for investors compared to some sky-high MLP yields, but this gives the partnership a much better cushion when unit prices fall during bear markets and higher expected distribution growth over time, because they are far less reliant on issuing new units to fund growth. While many MLPs have to consistently issue new units to raise growth capital, Brookfield can choose to do so opportunistically when prices are right, or can use its internally-generated funds instead. Unlike MLPs, Brookfield doesn’t generate unrelated business taxable income (UBTI) and can therefore be held in an IRA without likely tax consequences. This lets investors avoid worrying about the mild complexity of a K1. According to McKinsey & Company, the world needs to spend $3.7 trillion on infrastructure every year through 2035. With a market cap of around $15 billion, the growth runway for BIP is almost limitless as long as it can continue to capture just a tiny share of global infrastructure growth and existing assets. Brookfield currently pays about a 4.8% yield and targets 5-9% annual distribution growth for the foreseeable future. 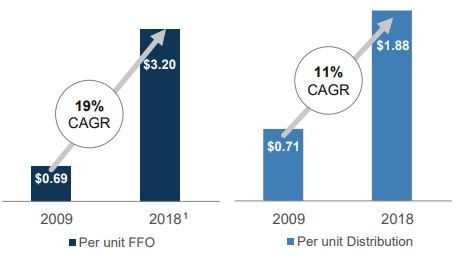 Historically they have exceeded their targets and generated 11% distribution annualized growth since 2009 due to being able to acquire assets from financially distressed companies at bargain prices, but mid/high single digit distribution growth is a more realistic estimate going forward. Both Brookfield Infrastructure partners and its parent company retain substantial liquidity and strong credit ratings, and are well-positioned to take advantage of low asset prices whenever there is the next economic downturn. During the global financial crisis, Brookfield bought shipping ports and various assets at bargain prices. More recently during Brazil’s 2014-2017 major recession, Brookfield increased their exposure to the country by buying inexpensive toll roads and gas transmission systems. The partnership’s global mandate gives them ample opportunities to acquire cheap assets wherever economic weakness exists in the world, whether it’s in North America, South America, Europe, or the Asia/Pacific region. Many investors worry about when the next market crash will come and what it will be like, but focusing on buying shares of high-quality businesses at reasonable prices lets you weather periods of volatility and economic contraction. And it feels better when your investment income comes from fundamental profits in the form of dividends rather than from selling a portion of your portfolio to the fickle whims of the market, at whatever arbitrary valuation it assigns at any given time. Investors that rely on selling 4% of their index portfolio per year for income are relying heavily on high stock prices to support their investment income. Whether global markets go up, down, or sideways for a while, dividend growth stocks with robust dividend yields can give investors income they need. As long as the company’s fundamentals are solid, the dividend payout ratio is reasonable, and an investor’s portfolio is diverse enough, their investment income should remain intact and growing through most market conditions. Disclosure: The author is long ENB and BIP. This is a guest post by Lyn Alden, who writes about equity research and investment strategies to inform investors on managing their money through all market conditions.